Prolink offers an entire suite of software solutions to address and automate the data collection and quality analysis tasks performed throughout any organization. At Prolink, we believe your time is valuable and should not be spent dealing with manual data collection. That is why QC-CALC is known throughout the industry as the easiest SPC software to implement. We integrate drivers from over 250 makes, models, and versions of every piece of automatic inspection equipment on the market allowing you to choose it from a list. Unlike many software makers that want to replace what you already own, Prolink products fit in with your existing software. Rather than try and be everything to everybody, we focus on integrating with the best in class providers of statistics, ballooning, and databases. If you already have a competitor of ours, it's ok. We can likely integrate with it. We have addressed the data collection and reporting needs of our customers for over 36 years. We have been around for a while and have likely already solved the problem you are facing. Below is a list of our products with short descriptions. Select the product title to learn more. QC-Mobile is a web-based application that works as a companion application to ERS by helping you to distribute reports, dashboards, full views and drill down statistics via any web browser on your network. Enterprise Report Scheduler facilitates the creation of interactive charts, dashboards, and Full Views enabling a top-down view of the overall quality within the factory. 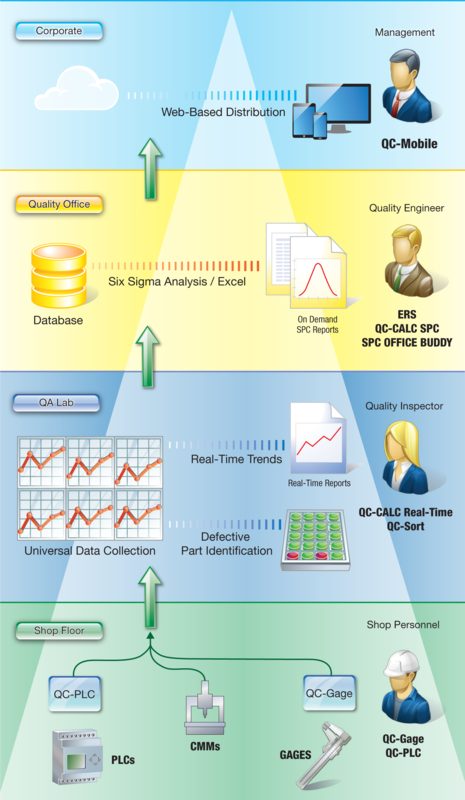 QC-CALC SPC is a comprehensive statistical process control application designed to monitor, manage, analyze, and report the results of your shop floor data. SPC Office Buddy provides a fast and easy way to create charts and reports in Minitab®, JMP®, and Excel®. Integrating with external programs allows employees to leverage existing software purchases and streamlines acceptance within your organization. First introduced in 1983, QC-CALC Real-Time is at the heart of Prolink's software suite and is the central hub of all data collection. It collects, analyzes, and reports the inspection results making data collection seamless regardless of the equipment purchased or software used. QC-Sort is a non-statistical application that is used to easily identify out of specification parts on a multiple part fixture. QC-Gage is designed to collect inspection data directly from electronic gages that are not as programmable as CMMs. Regardless of the data source, QC-Gage is ready to automate data collection. QC-PLC provides a fast and easy method of reading data from programmable logic controllers (PLCs) at regular intervals saving time & money with improved accuracy.